American vodka takes on its Eastern European counterparts. Ask 100 legal-age American consumers where Smirnoff, the world’s biggest selling brand of vodka, is made and the heavy betting is on the majority of respondents replying with something akin to, "Well, it’s got to be Russia, right? Aren’t most top-drawer vodkas made either in Russia or Poland?" It’s true that oceans of vodka are produced in Russia, former Soviet-bloc nations such as Estonia, Belarus, Latvia, Lithuania and Ukraine, and Eastern European countries like Poland and the Czech Republic. However, vodka comprises 25 percent of the distilled spirits sold worldwide, and its increasing global consumption has forced wider production. Long gone are the days when premium vodka was only a product of Russian or Eastern European origin. Other major vodka-producing nations now include all Scandinavian countries, France, Holland, Scotland, Italy, Ireland, England, Germany, Canada and the United States. In fact, Smirnoff, our brand in question, has been distilled in Hartford, Connecticut, since the 1930s. Smirnoff started out as a Czarist-era, 19th-century Russian vodka and was known by the name "Smirnov" after its founder, Piotr Arsenyevitch Smirnov. The upheaval caused by the Russian Revolution in 1917 and subsequent fading family fortunes shifted the vodka to France, where in the 1920s the name was altered to Smirnoff. That’s when entrepreneur Rudolph Kunnett and John Martin, the president of then-drinks giant Heublein, introduced the brand to the United States. In a tall glass, muddle cucumber slices and honeydew with Level vodka. Fill with ice. Add fresh sweet and sour and top with Sprite. Garnish with a piece of cucumber. Mix ingredients in a Boston shaker and strain into a martini glass. Garnish with a skewer of raspberries, star fruit, or lemon or lime twist. Mix ingredients in a blender. Serve in an old fashioned glass over ice. Created by Bellagio beverage manager Drew Levinson. Shake and strain into ice-filled glass. Garnish with pomegranate seeds. *Combine 2 parts fresh squeezed lemon juice with 1 part strong simple syrup. Combine all ingredients in a shaker with ice, shake until combined, strain into stemmed glass. The well-established cultural identifications with Poland and especially Russia were so strong after World War II when vodka gained traction in the United States, that it makes complete sense for marketers to have capitalized on that perception. Besides, from the demise of Prohibition through the early 1950s, vodka was popular in America solely within the Russian and Eastern European immigrant communities of the major Midwestern and northeastern cities. As vodka sales multiplied from the late 1950s to the early 1970s, Smirnoff competitors appeared sporting names with decidedly Eastern European/Russian rings to them: Popov, Nikolai, Vladimir, Kamchatka, Natasha, Tvarski, Korski, Karkov, Rikaloff, Ruble and Kimnoff. Then in the 1970s came the classy, up-market imports supported by clever advertising: Stolichnaya from Russia and Absolut from Sweden. With the emergence of these two stylish brands, the spirits industry landscape forever changed. In 2005, according to the Distilled Spirits Council of the United States (DISCUS), vodka accounted for 27 percent of all spirits sales in the United States, with the largest gains seen in the high-end (up 7.5 percent) and superpremium (up a remarkable 23 percent) categories. Yet for all the marketing efforts to align with vodka-making countries from the Old World, many contemporary American distillers believe that the new vodkas produced in the United States need not hitch their images to the nations that invented this most popular spirit. Such is the case with the exciting breed of high-end premium and superpremium native vodkas that sell for $30-35 per bottle. Russian vodkas are generally thought of as being robust and flavorful, Polish vodkas are perceived as sweet and classy, and Scandinavian vodkas are characterized as tasting light and ephemeral. But what reputation do United States vodkas have? Has a distinct American vodka style evolved over the last seven decades? I asked some of the best vodka distillers and marketers what they thought about the matter of style. Miles Karakasevic, owner and master distiller at Domaine Charbay Distillery in Napa Valley, said this: "We at Charbay emphasize the grain fragrance [and] smoothness with fullness on the palate as essential characteristics of the ‘American-style vodka’…[This style is] tailor-made for the rigors of being blended into numerous cocktails, on the rocks, or shaken into a martini, but not necessarily for drinking cold, straight, down the hatch, [as is] the classic European fashion." Anyone who has sniffed and tasted Karakasevic’s assertive and intense Charbay Vodka will immediately understand the point he made. 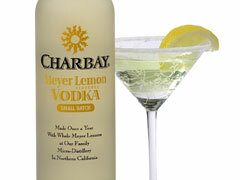 If anything, Charbay’s bold yet elegant character is a cross between the heartiness of Eastern European vodka and the finesse exhibited by Scandinavian vodkas, thereby creating an exciting hybrid style that can be described as American or even Californian. Also, bear in mind that approximately 90 percent of vodka poured in America ends up in cocktails, so distillers are virtually required to take that application into account. By stark comparison, over 90 percent of vodka in Russia and Eastern Europe is consumed straight up. Kevin Egan, vice president of 21st Century Spirits, markets Blue Ice Vodka, which is produced from Idaho russet potatoes. Egan largely agrees with Karakasevic on the issue of an American style. "American producers have historically produced vodkas that were not competitive quality-wise with European brands. Now, small distillers are creating quality American vodka of equal and/or better taste and quality when compared to European vodkas. The new American vodkas are eclectic, very distinctive and complex," says Egan. Uniqueness in any spirit can frequently be traced back to the environment in which production occurs or to the materials of a particular location. Certainly, single malt Scotch whiskies can reflect their place of origin. The same holds true for Cognacs that hail exclusively from one of the six demarcated growing districts, most notably, Grande Champagne and Borderies. Even with a fundamentally neutral spirit like vodka, it is possible for the place of origin or base material to shine through in the final product if the vodka is produced on a small scale. Duncan Holaday is the president of Duncan’s Spirits in Vermont. Holaday produces vodka using raw materials like the sap of maple trees. "A real artisanal vodka is rooted in a particular place, with distinctive water, sugar and traditions," says Holaday. Vermont Spirits Gold, for example, is unique because of the ecology of northern New England, the tradition of maple sugaring and excellent water. It is American because it’s made in this small part of America. It is unique because it brings out the character of its substrate, maple sugar." But not everyone in the American distilling industry ascribes to the idea of an emerging authentic American vodka style—not just yet, anyway. Mark Brown is the president and CEO of Sazerac Company, which owns and operates the fabled Buffalo Trace Distillery in Kentucky. Brown’s distillery produces Rain Vodka from American organic corn. When asked if a distinct American style is emerging, Brown replied, "The short answer is generally ‘no, but it needs to.’ In the case of Rain, we’ve managed to achieve a very distinctive taste/aroma profile…because it retains a substantial amount of the original grain’s—white organic corn’s—character both in taste and smell. We’ve found that some consumers really like it and others really dislike it. On balance, we are pleased to have taken the risk." It’s refreshing to me as a journalist and highly beneficial for consumers that visionary distillers like Mark Brown (Rain), Miles Karakasevic (Charbay), Jorg Rupf (Hangar One), Duncan Holaday (Vermont), Burt Beveridge (Tito’s Handmade) and Pat Couteaux (Shakers), aren’t afraid to take a chance on a cutting-edge concept, even when they acknowledge the possibility that some consumers won’t care for the final product. That’s how a whole category advances and evolves. That’s how distillers and the public both learn about what works and what doesn’t in a category of spirits. Most importantly, that’s how the products with genuine quality rise to the top as benchmarks. After pondering our nation’s place in the international vodka pecking order, I’m now convinced that it’s immaterial whether American vodkas develop a distinctive style. What’s so intriguing about the scores of vodkas being produced in the United States right now is their stunningly wide array of qualities, personalities and virtues. Hangar One Vodka is totally different from Shakers Rye Vodka, which is completely different from Skyy 90 Vodka, which is miles apart from Tito’s Handmade that inhabits another planet far from Smirnoff and on and on. Egan called the new generation of American vodkas "eclectic." Maybe that’s the description that they rightfully deserve and perhaps that’s the status that will propel them forward. Perhaps vodka of no particular style is the most suitable way to go. After all, America is the ultimate international arena where all social and cultural levels shine. Why not the United States of Vodka? Listed below are the unflavored American vodkas that display the world-class skill of domestic distillers.